We only collect the personal information necessary to process your order that you provide to us. 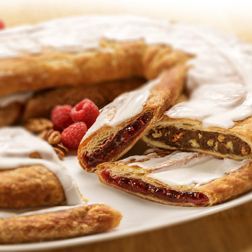 Racine Danish Kringles® takes great pride in offering an exceptional online shopping experience. We guarantee that every transaction you make with us will be safe and secure. This means you pay nothing if unauthorized charges are made to your card as a result of shopping at kringle.com. We use the industry-standard encryption protocol known as Secure Socket Layer (SSL) to keep all of your order, billing and shipping information secure. If any unauthorized charges were to appear on your credit card as a result of shopping with kringle.com, you must notify your credit card provider in accordance with its reporting rules and procedures. We will cover the liability of purchases made through this website only if the unauthorized use of your credit card resulted through no fault of your own. If your bank holds you responsible for fraudulent charges, we will cover your liability up to $50.00.